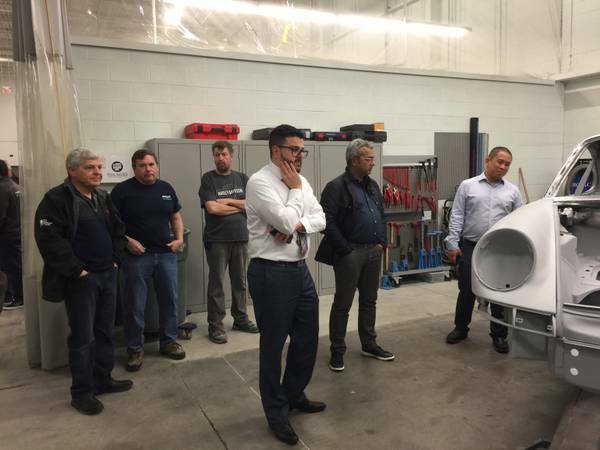 Vaughan, Ontario -- May 1, 2017 -- Pfaff Autoworks recently hosted an information session at its Vaughan facility for the Porsche Club of Canada – Upper Canada Region (PCA-UCR). The bodyshop welcomed over 50 guests from as far away as Georgetown, Ontario. The event presented an informative session on the evolution of Porsche 911 bodies and construction techniques. Pfaff Autoworks is the collision repair division of Pfaff Automotive Partners, which also operates a number of dealerships and a racing division. Inside the facility’s special aluminum room was Pfaff Porsche’s 2015 911 GT3 Cup car, representative of state-of-the-art, modern Porsche construction techniques. With a body consisting of about 60 percent aluminum for lighter weight, the “991” generation body is largely riveted and bonded together. Its combination of steel and aluminum makes for an incredibly light and stiff structure, which benefits performance, but also makes collision repairs more time consuming and complicated. The new hybrid-construction 911 can only be repaired one way, with potentially catastrophic consequences for corrosion protection and safety if the proper, manufacturer-approved techniques are not followed. Jeff Pabst is Pfaff Autoworks General Manager. During the event, Pabst explained that the bodyshop’s technicians spend at least one month out of the year away on training to learn the latest techniques from Porsche. Pfaff Autoworks is a Certified Collision Centre for Porsche. The facility also certifications for Volkswagen, Audi, BMW and McLaren. Also on display was a 1972 Porsche 911T Sportomatic restoration project, a collaboration between Pfaff Autoworks and Pfaff Porsche to demonstrate competency in repairing and restoring classic vehicles. With over 400 hours invested in the project, the body shell has been transformed from the rusty, rotted shell that arrived at the shop over a year ago. The floor, rear-seat platforms, front trunk area and windshield surround have been replaced by new pieces. The dashboard has been repaired and new fenders and doors have been fitted. Corrosion resistance has been significantly improved with the use of modern primer and coatings. The restoration project will be finished in its original medium green colour before returning to Pfaff Porsche, where its fully-restored mechanical parts will be re-fitted. Once owned by Canadian racing legend Horst Kroll, this 1972 coupe is a true piece of history. Pabst drew some interesting parallels for the crowd between 1972 and modern-day Porsche production and repair techniques. While materials science and engineering have advanced significantly over the last 35 years, both cars were built and are repaired using Celette benches. Participants in the workshop were also given modern and historic copies of the shop manuals, highlighting how the engineering and construction of these vehicles have evolved over time. The evening was also graced by some choice selections from Pfaff Porsche’s classic used car inventory, including a Porsche 912, 1988 911 Jubilee Edition, and 1996 911 Carrera. For more information, please visit pfaffautoworks.com.